Credit scores: Everyone’s got one, even if they don’t know it — and these numbers can have a profound impact on the trajectory of your life. Representative Alexandria Ocasio-Cortez knows this firsthand, thanks to a false claim circulating about her credit score. 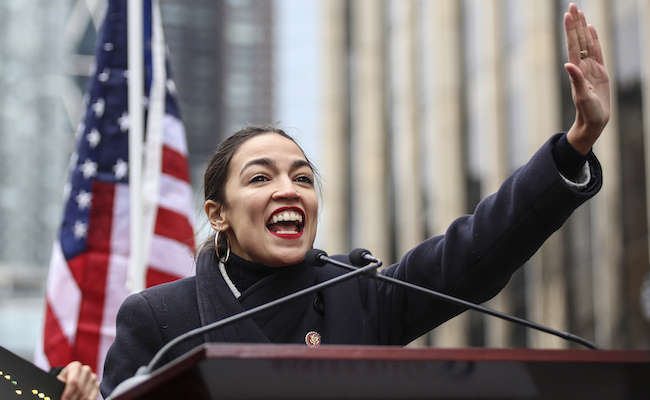 AOC’s comment is a timely one; as a member of the House Finance Committee, she’s in an excellent position to do some digging into the practices of the credit scoring industry, which is dominated by firms Experian, Equifax and Transunion. As anyone who’s tried to do anything that requires credit history — buying a house or car, getting a job, buying car insurance, applying for a line of credit, getting housing — knows, the scores developed under the secret sauce used by these companies are arbitrary, really difficult to appeal and hard to shake. If you mess up your credit, it can take years to clear — whether you have some financial trouble and miss a few bills, rack up credit card debt, experience a foreclosure or anything else. Many consumers are advised to regularly check on their credit reports for signs of anomalies. In fact, the big three firms are required to furnish free reports periodically by law. Without regular monitoring, a black mark on your credit may come as a nasty surprise. For instance, someone once bought a house under my name — and it went into foreclosure! We aren’t “customers” of these companies in the sense that we opt to do business with them. They start scraping data about us as soon as we begin establishing credit histories — like with student loans or first credit cards in college — and scoring us accordingly. Being delinquent on payments, having too many accounts or carrying too high a balance are all marks against you — but having little to no credit can be bad too. This isn’t just about qualifying to buy a new Corvette on credit. While scores can’t be released to third parties without your consent, more people are finding themselves asked to sign consent away when they’re applying for housing and jobs, as well as a variety of other situations. Their credit scores have become a substitute for their worthiness and reliability as humans. And that’s not even accounting for “social credit scores” like that used in China, which draw on technologies we’re also using here, such as scraping social media accounts for compromising information. Algorithms used in credit scoring in the U.S. appear to disproportionately target black and Latinx people for low scores, even when controlled for other factors. Low score? You may be denied a loan or offered one at bad terms, like very high interest. People with extremely low scores may be driven to “alternate financial products” like payday loans, which can put them even deeper in the hole. This can be a huge problem for students struggling to make ends meet, and AOC has made it clear that she wants to address the student loan crisis during her time in the House. Many people think credit scores are unfair, and these advocates are pushing for reforms to this system — especially since companies like Equifax can’t even keep our data secure. That’s why Ocasio-Cortez’s remarks are so important. She may not be able to singlehandedly take down the credit scoring industry, but she can push for hearings focused on their practices so the public and Congress can learn more about how they operate. In turn, that could inform some legislative change that could make a huge difference — like bans on how and where this information can be used, as well as better redress for people with low scores who feel like they’re being treated unfairly. Incidentally, Ocasio-Cortez isn’t the only one feeling skeptical about Equifax: Wall Street is right behind her. That’s a combination you don’t see every day! You know what else is big??? her mouth!!! yikes!! hello, Mr. Ed! Live within your means, pay your bills on time and you don't need to worry about your credit score, it will take care of itself. (830 here). Pay the credit cards in full every month, no interest and the cash back rewards add up fast! David F. I don't bother looking up anything you say because you,re a ,rightwinger and we know you and your sources lie and you've been doing this for decades. You support the status quo , your not a progressive, and you're just plain mean spirited and don't even remember that the 'puke' name calling STARTED WITH YOU. If I was going to indulge my name calling your ears would have burned off by now. You don't belong here because you're a troll, and you know it so get off. Evil and cruel. I pray that beautiful lab finds an owner who knows what love is...a dog's unconditional love.